Amazon Echo Dot (3rd generation) review | What Hi-Fi? If Jeff Bezos, Amazon’s CEO, does take over the world, he might just have the Amazon Echo Dot to thank. As Amazon does its level best to infiltrate every possible product market, every possible home and every possible room, the new Echo Dot 3rd generation is perhaps the most enticing way to bring Amazon’s Alexa voice assistant into your home. But if you like the idea of a smart assistant combined with a simple music speaker, it’s hard to argue against the Echo Dot. There remains something quite futuristic about bellowing commands at, and hearing responses from, a little electronic voice in a box, but on the surface everything about this product is pretty simple. The small, puck-shaped design remains but it has been jazzed-up and improved on this 3rd-gen Dot. Fabric replaces the hard exterior of the previous model and the controls on top of the device have had a makeover, too. It looks noticeably smarter as a result – we see it as a nice addition to a room rather than something you want to tuck out of sight. 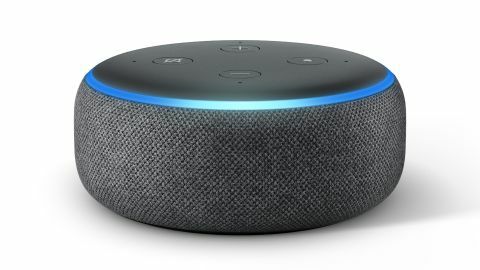 You need to connect the Echo Dot to power, and you can wire in other devices via the 3.5mm aux output for better sound, but otherwise it can go anywhere that it can hear your voice. Once powered-up, it’s simple to use the Amazon Alexa app and get it connected to your wi-fi network. The 3.5mm audio output and Bluetooth connectivity is about as much as you get it. This means if you do want a bigger, better sound than the Echo Dot can deliver, then you can make a wired or wireless connection to another device. Otherwise, it’s all about Alexa in terms of features. And it’s worth pointing out that all this connectivity, and everything Alexa can do, is in line with the previous model. Alexa can still play music, answer questions, read the news, check the weather, set alarms and control compatible smart home devices, from TVs to home cinema amplifiers and speakers. And you can control Spotify and TuneIn, as well as Amazon Music. Voice calls are a relatively new addition, while the number of Skills – devices that work with Alexa – are constantly growing and include a whole suite of products from Sonos to Domino’s Pizza and Uber. What is new, is a new driver and a change to the microphone layout. There’s a 4cm driver here as opposed to 3cm on the previous model and Amazon claims it’s 70 per cent louder as a result. Interestingly there are fewer microphones, four rather than seven, but tweaks to the design aim to make performance every bit as strong. The three key strands of the Dot’s performance are how well Alexa hears you, how good the speaker sounds (for answers and music), and what it can do. The previous Echo Dot was already pretty impressive in terms of hearing your commands, and we’re every bit as happy with the performance here. Even with music playing, a clear command will wake Alexa. Understanding your question, and allowing for accents, means it’s not perfect but, for the most part, it’s pretty impressive. “Alexa, what are the news headlines?” and “Alexa, what’s the weather?” prove easy; “Alexa, play some French rap” pulls up a relevant Spotify playlist, while “Alexa, say something in French” returns the actual French word for ‘something’ – just the sort of smart Alec response which AI will hope to improve in coming years. We add the Sonos skill and can soon control music across a multi-room system of Sonos devices. Naturally, the Echo Dot needs to be able to hear you, but you can also talk to the Alexa app on your phone when you’re out of earshot. Again, product compatibility will only widen and improve, but already brands such as Denon, Marantz, Onkyo, Pioneer and Yamaha offer Alexa compatible AV products. The sound quality is arguably the most impressive upgrade here. Despite similar dimensions, the change to the driver has clearly had a positive effect. It’s louder, for sure, but it’s better than that. The lean, thin sound of the previous models, which was comfortably bettered by the Google Home Mini, has been replaced by actual bass notes, full-bodied voices and a smoother treble. This means we really don’t mind the Echo Dot as a background music device. Of course, your main hi-fi system should be something better if possible, but for the kitchen or kids’ room, or for the occasional convenience, we don’t mind music playing on this tiny budget speaker. And that’s saying something. More pertinently perhaps, it means Alexa sounds much more agreeable at all times: clear, loud and easy to understand. The new Echo Dot is the easiest, cheapest and best way to bring Alexa into your home. It works well on its own or can be nicely integrated into myriad other smart home and AV products, bringing voice control and smart features just a command away. In line with the latest Amazon Echo products, the sound quality has noticeably improved, and while for a ‘proper’ smart speaker an upgrade even to the more substantial 2018 version of the Amazon Echo Plus would be money well spent, this remains a simple and effective smart speaker that’s easy to recommend.